Don't Throw Away Broken CDs!!! 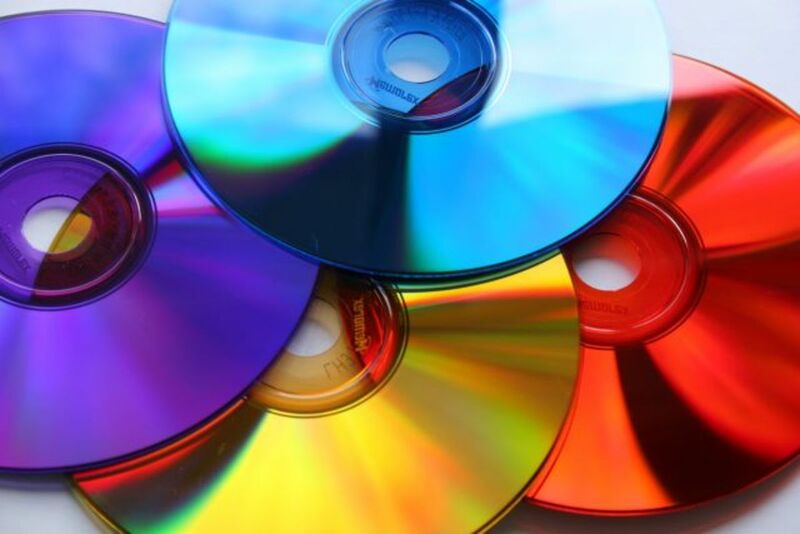 This page will make you think about new ways to reuse your old CDs and DVDs instead just throwing them into a trash can. There is a little bit of everything and everyone here so I surely hope you will find a smart use for those broken CDs and DVDs in your own home. How to CUT CD or DVD? If CDs or DVDs are placed into nearly boiling water in a pan and carefully removed, they can be cut fairly easily with scissors into different shapes (for badges, decorations etc). Be careful not to leave them too long in the water and keep an eye on the progress at all times. Only do this in a well-ventilated area to avoid being affected by possible off-gassing from the chemicals used to make disks. Simple and Effective: Catch Candle Drips On Used CD! You should always use a candle holder specifically designed to catch melting wax. However, if one is not available, a CD is great alternative. Make sure it's a short and fat candle that can stand on its own with a flat bottom. It should also be slightly larger than the CD hole. Place the candle holder on a stable, heat-resistant surface and keep a watchful eye on it. Tape CDs or DVDs to your bicycle wheels and use them as reflectors. Forget those ugly orange reflectors. Instead, drill small holes in a CD and screw it onto your mailbox post or onto a wood stake and push it into the ground. Install several of them to light a nighttime path to your front door. Reuse CD as Paper Plate Weights and Keep Them from Flying Away! On outdoor picnics, solve the problem of paper plates blowing away! Place three drops of glue on the outside edge of a CD-ROM and put it on the bottom of a paper plate. This will also help to stiffen the paper plate. When you throw the paper plate out, just pull the CD-ROM off the bottom. What should you recycle, renew, and reuse? Practically everything! Is there a gadget graveyard in your house? Want to get the most mileage out of your electrical appliances? Tired of having to choose between paying high prices for repairs or good money for a cheap replacement? Well, no more! These savvy secrets help you make the most of your purchases-and your money-by making things last longer and work better. Simple Way to Save Lighting Energy - Use CD to Magnify Light Output! Use them for reflectors on lamps, above the bulb. This magnifies the light output, without additional electric use. Make sure not to put them too close to a bare light bulb and do not put them near a halogen bulb. String the CDs into a single strands with yarn then attach the long strings to the top of a doorway to make a high-tech 60's door screen. Hidden Plug Help by Turning CD in a Mirror! Do you ever have a problem plugging cords into the back of your computer, stereo, or other electronic device because you can't see the back without pulling the unit out? Just put some double stick tape on the non-mirrored surface of the cd, line it up with what plugs you need to find and attach it to the wall behind the appliance. Now you have a cheap (free in fact) mirror to help you out...and you don't have to worry about damaging it, as a replacement will be sent every now and again, whether you ask for it or not! When you don't have a vase that works because the stems are either too short or won't hold the flowers up - take a CD and put it over a glass of water. I put the flower stems through the hole of the CD. It holds them up and the shiny surface of the CD acts like a mirror to display beautiful flowers. Use them under your couch and chair legs to help protect your carpet from getting the dreaded furniture indent. On the CD-ROM write the name of your vegetable with a permanent marker. Glue or tack the CD-ROM to a stick and put in the ground to mark your garden rows. They may also act as a high-tech scarecrow. Dangle them on a piece of string over newly planted seedlings to scare off birds - they look prettier than scarecrows when they glint in the sunshine too. Don't cook CDs in the microwave - they might give off toxic fumes. This is quite cool project! CDs are mostly used for music, right? Well, repurpose them for something connected to music! 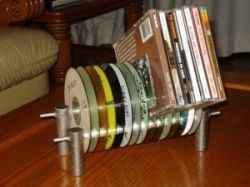 Make a CD rack and place all your favorite CDs in one place! This cool project comes with full instructions! Just an extra hint: you can change it into any color you like with acrylic colors! Use CDs for extra style! Decorate your Christmas tree in style! Hang CDs shiny side out to create a flickering array of lights -- or paint and decorate the label side to create inexpensive personalized ornaments. For variety, cut the CDs into stars and other shapes with sharp scissors. Drill a 1/4-inch (6-millimeter) hole through the CD and thread ribbon through to hang. 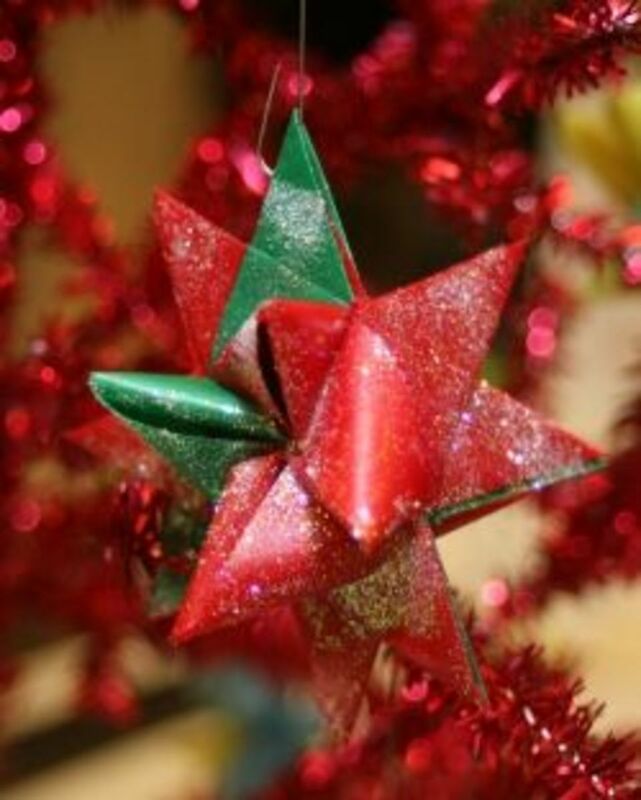 Another way to use up CDs for Christmas ornaments can be found in this YouTube video. Make a Christmas Wreath with Old CDs! - Add a Chrismas light and ribbon to make it even more festive! Old CDs make inexpensive and quirky wall art for your teenager's room. Attach the CDs with thumbtacks and use them to create a border at the ceiling or halfway up the wall. Or let your teen use them to frame his or her favorite poster. Looking for a funky, decorative bowl? Place a CD in the oven on low heat over a metal bowl until the CD is soft. Wearing protective gloves, gently bend the CD into the shape desired. Seal the hole by gluing the bottom edge to another surface such as a flat dish using epoxy or PVC glue. Don't use the bowl for food. Divided into sections dealing with paper, plastic, metal, and fabric, the book tells how these materials are made, traces their history, and explains how they can be recycled, emphasizing benefits to the environment. Tips on how youngsters can make a difference appear throughout, and interviews with artists who work with recyclables are included as sidebars. Scattered circles contain information about the inability of various substances to break down. Several art projects are provided for each type of material. For this effective sun catcher all you need is couple of used CDs! Sun catchers are attractive to watch, and all you need to make one is a couple of CDs. Glue two CDs together, shiny side out, wrap yarn or colored string through the hole, and hang them in a window. The prism will make a beautiful light show. Have fun by making old CD spin! 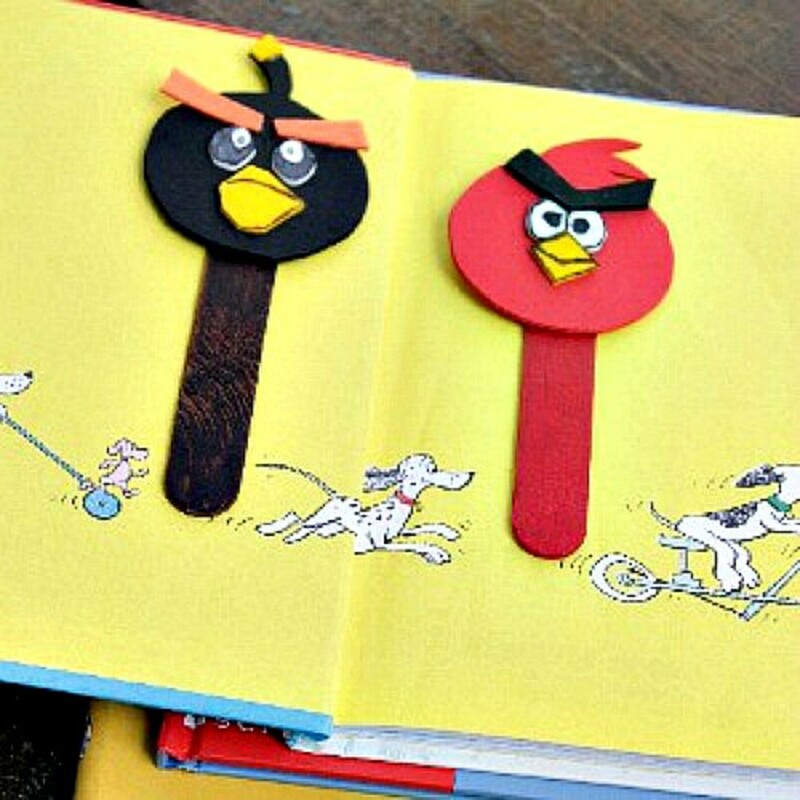 Turn an old CD into a fun toy for the kids (and adults too!). With a knife, make two slits across from each other in the CD hole. Force a penny halfway through the hole, and then spin the CD on its edge. Old CDs can be functional! Turn a disc into a funky clock face for clockwork sold by arts-and-crafts stores. Paint and design one side of the CD and let it dry. Write or use stickers to create the numbers around its edge. Assemble the clockwork onto the CD. Reuse felt scraps and old CDs! CDs can help to prevent those unsightly stains from cups left on the table. Simply cut a round piece of felt to fit over the CD and glue it onto the label side of the CD so that the shiny side will face up when you use the coaster. You can always wash CD and use it again! If you're an artist, use the small circular discs as paint palettes. They're easy to wash off and you can even use a few at a time. Kids will have fun with this simple game! Make a large checker board with the spots the size of the CD-ROMs (eight squares by eight squares). Mark 12 CD-ROMs with a red "X" using a red marker and 12 CD-ROMs with a black "X" with a black marker. Kids will love to play a "high-tech" game of floor checkers. I painted old CD's with craft paint, added stickers of all kinds, and drilled a hole and made a CD Mobile. When the wind blows them, the shiny side gives off brilliant colors and yet it is neat to see the other creative side. If you want, you can add bells, or whatever on bottom for chime effect. Fun to do! Glue two CD's together using Tacky Glue. Let dry. Drill one tiny hole in top and five or six holes along bottom. Use permanent magic markers to decorate both sides of CD's. Draw a simple design with a black marker and fill in with the colored markers. Hang beads or metal rods from bottom holes using floss or fishing line. Tie a piece of same in top hole and make a loop for hanging. You can also decorate these C.D. 's with sequins or beads instead of the magic markers. Even birds have use of old CDs! Coat them with peanut butter or bacon grease, dip in bird seed, run yarn through the hole in the middle and attach to a tree branch. Need to draw a perfect circle? Forget tracing around cups or using cumbersome compasses. Every CD provides two circle sizes -- trace around the inner hole or the outer circumference. You can reuse old CDs as mosaics for picture frames, boxes, etc. Great for an old notebook that needs a new look. Break the CDs up into about 1/4 to 1/2 inch pieces. Arrange the pieces on the cover in a mosaic tile pattern. Use hot glue or spray adhesive to put them in place. This could look great in any mosaic pattern -- on picture frames, hat boxes, etc. CDs pretending to be 45 records! Put CD's on old clothes for a high tech costume. Your teacher will love this! Painting apples on them, A B C, and 1 2 3. Use gold foil ribbon, drill a hole on each side at top, place beads on it, spelling teacher. Glue CDs onto a piece of cardboard, one right next to the other (shiny side up). Decorate the edges of the cardboard and attach it to the back of a door. Using CDs you'll need no envelope! Stamp a cute design on a piece of sticker paper and apply to the printed side of the CD. Use a permanent marker. to address on the shiny side... add .44 cents postage and drop in the mail. No envelope needed...and it's lots of fun! D . I . Y . Done ! It 's Yours ! : Reuse old CD to art work or decoration. Awesome CD craft with felt. Kids will have fun reusing old CDs! free printable instructions for making a Bijou CD Rom or paper craft. free printable instructions for making a Dexter CD Rom or paper craft. free printable instructions for making a Hamtaro CD Rom or paper craft. free printable instructions for making a Pashmina CD Rom or paper craft. CD ROM POKÉMON CRAFTS Click links below to be taken to the instructions and templates for the CD Rom craft. free printable templates and instructions for an elephant bible craft to go with the If I were a butterfly... song. directions and free printable templates for making a frog paper craft. Good for preschoolers to practice the circle shape. Pumpkin pouch to put candy in. A magnet for your fridge... a center piece for your fall table...something decorative for the wall or a fairy home table top! Tell us what you plan to do with all those unwanted CDs? Are you crafty person or your kids could reuse them for crafts? Maybe in a garden? Share with us, we want to know! And if you have a tip of your own, add it here and we'll add it to the other tips so everyone can use it! Thanks! Have You Found Any Useful Ways to Reuse Broken CDs and DVDs? Great inspiring article! I already use old CDs, but your lens gave me many more ideas. I think you've covered about every idea there is to re-use old CDs. I've used mine as hanging mobiles and in my garden as scarecrows. Great article! Great lens. Very creative. My favorite use of an old CD was to string it off the side of the house to frighten away the woodpecker. Some very creative ideas here -- who would have thought you could do so much with those little things. Thanks for sharing! Neat lens. Lots of great ideas. Great suggestions! I can imagine the discs strung up on fishing line and held vertical so the wind catches them and moves them in the sun light. You would get some awesome iridescent visuals that way. This is interesting. Never really thought about reusing a CD. Great ideas and great lens!! Wow what a creativity, i especially loved the Flower Holder and Sun Catcher idea and will give the light idea a try, thanks for the inspiration! What a brilliant lens. Must get my young grandchildren to read it and then they can never say that they are bored and have got nothing to do. Where did you get all those great ideas? I love them! I bought a drill for the express purpose of making a scrapbook album from excess CDs! Liked. Blessed by a Squid Angel. Great ideas. I use them for target practice with my kids and their bb guns! These are really Environment-friendly ideas .I never knew that you could use an old CD for so many things! !Thank you for this amazing article! You can make a spectroscope using a cut up old cds(look up easy plans online). This uses the dispersion of light (different wavelengths bend different amounts) to break up any incoming light into a rainbow - or, for LCD screens or fluorescent lights, into only those colours that are actually in the white light. Fun ideas. I have tons of old discs around the office. I was thinking of crocheting a cover for them and making coasters out of them, like my aunt used to do with plastic coffee can lids from 1 lb. coffee cans. Blessings! What a lot of ideas! I like the ones about candle wax collector and vase flower holder. I am absolutely amazed that people have come up with so many fantastic ideas for old CD and DVD. This is very informative and inventive. I am submitting this to today's quest. I just love some of these ideas. I burn a lot of cd's and get a lot sent to me. Result I have hundreds despite the occasional clear out. Going to use some of these! I love the idea by making it as a sun catcher. very interesting lens, thumbs up! sweet lens! i def have a *ton* of old CD's....awesome ideas! Wow! Great ideas, only thing is I wish the USB lamp video had the talking instructions besides showing how to do that. That was ingenious really, I liked that Idea and the wreath the most. Now I want to experiment. Great lens! I'm just kicking myself for not thinking of CDs as driveway markers - brilliant! I really did learn some good tips and pointers hear from you, thank you for that. Door Hangers for the kids room! Love that one. I print out photos and glue them to the CDs then glue the CDs together with a string between the CDs as long as you want. Hang a dozen CDs on the string and put a loop at the top and hang from a hook in the ceiling. they twirl and you can see all the photos on both sides...it's a moving photo album. These are amazing! I was only ever able to come up with one idea for old CD's an' even that wasn't a very good idea. I am so impressed by how many different uses you have found for old CD's. Thanks for some awesome ideas. Great ideas, my teens will love the door hangers and room borders! Coasters - do it all the time - saves the furniture! Wow! The number of things you can do with old cds is amazing. The only one I knew about was haging them from fruit tree to scare off birds. Great lens. Thanks. I got tons of CD's lying around, definitively got some ideas what to do with them now. I have a stack of disks that I almost threw away. Thanks for the great ideas on reusing them! I recently searched through all my CDs and now have a stack of unwanted ones. I knew there were craft ideas, and a Google search brought me to your lens. Awesome ideas! Thank you! I have seen a few art projects done with old CDs, but I have tried any yet. A very creative and interesting lens. Thanks! Now I have some ideas for all the CD's I don't use anymore. Wow! You found some great and creative ideas. Thanks for sharing. I saw CDs used as trail-markers one time. I found them easier to follow than a painted dot or small dog tag. The CDs are reflective and large! I'll have to revisit this lens because I love all the ideas you have on it. Thanks for sharing! Some very creative uses for CDs, I think I will make the paper weight. Thank you, a lot of time obviously went into this lens and it shows. Take care. Wow! I never knew old CDs could have this many uses. Nice lens. Ha! I have a pile of these somewhere for "just in case"! This lens has been blessed on the "I Love That Word" quest and added to my Upcycling Ideas lens. I like the wreath made from cd's. check out what i make wreaths from. I received a valentines card from my wife a few years ago, the image of a heart had been made using red crushed up cd's that had been arranged in a mosaic pattern on the card. It was lovely. These are some great ideas. Awesome Lens. Thank you! @anonymous: I like that idea too! I love the clock ideas. I'll definitely have to try that. I also got some other ideas from this lens. Thanks. 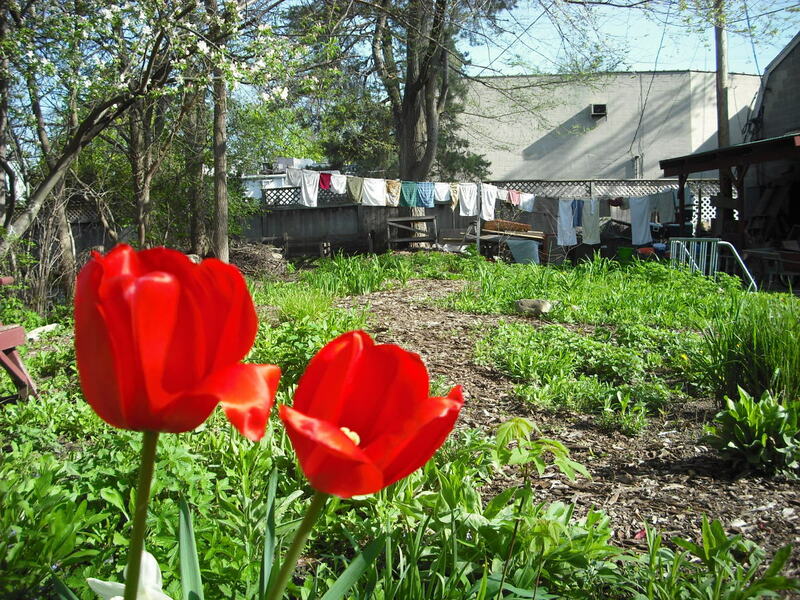 I lived in a housing co-op more than a decade ago. We had a bunch of AOL CDs so we hung them all over the Christmas tree. That was most of what we had for decoration. SquidAngel blessings! Great lens but one bit of advice needs a bit more work on. It is dangerous to boil cd's in a domestic environment, they give off very hrmful gasses. Wow! And all I've done is paint on them! Great info here, I've got hundreds of old cds. Thanks for the work you put into this! Great info. I'm not crafty, but I try to reuse and recycle wherever I can. Very cool ideas! Thumbs up. great ideas and thanks for very detailed videos! Its great to see the various reuse options for CDs and DVDs. Great to see you promote recycling and reusing. I always get a great sense of accomplishment when I re-purpose an item to solve another problem - especially for free. Some really useful ideas here for how to reuse or recycle old cds - it was always a mystery for me to work out what to do with them! Big thumbs up from me for the work you put in this lens. Great ideas - the rather shiny Christmas wreath is pretty awesome. Some excellent ideas. I'll have to give some of them a try.